CINCINNATI - FC Cincinnati President and General Manager updated fans about the team's Major League Soccer bid on Twitter on Wednesday afternoon and later said there are no plans for an announcement Thursday or Friday. Berding said the MLS bid is "still very competitive." He said the franchise award process was not as simple as a meeting and then an announcement. The league announced Wednesday at 5 p.m. that Nashville would be taking one of the two open spots, leaving FC Cincinnati to compete with Sacramento and Detroit for a franchise. RELATED: With Nashville seemingly in, here are some possible MLS expansion scenarios. Based on a second tweet from Berding, it does not sound like a decision on FC Cincinnati will be coming before Christmas. FC Cincinnati spokeswoman Fumi Kimura told WCPO that MLS officials set the timeframe for any decision or announcement. No timetable has been disclosed. Kimura said Berding sent the tweets because FC Cincinnati supporters were calling the team offices looking for updates on the expansion process. Because of the delay in announcing a second franchise, fans and analysts have speculated that MLS could have concerns about Cincinnati's bid. Berding said on a WLW radio show that concerns about the stadium's site are speculation only. The Oakley location the team has identified could still be OK for MLS. Berding said it is only speculation that the bid is in trouble. "I've never wavered in my confidence because it's a story that sells itself," Berding said. County and city leaders repeated that they’re positive about FC Cincinnati getting a franchise, but they say they’re in the dark about when to expect announcement. "I still believe we're the best choice,” said Todd Portune, president of the Hamilton County Board of Commissioners. “We've had two years of operation. When they think of what they want in an expansion franchise, they think of what we have here with FC Cincinnati — the fan excitement, the support, the enthusiasm, everything they've brought to bear. "With the holidays, I could see this decision being delayed until the first week of January,” Mayor John Cranley said. FC Cincinnati and the other finalists made their pitches to the MLS expansion committee in New York on Dec. 6. At the end of the day, Berding said he was optimistic. “We are a proven market. We are not a projection. That is certainly a strength of ours," Berding said, alluding to the fact that Nashville and Detroit do not have pro soccer teams. 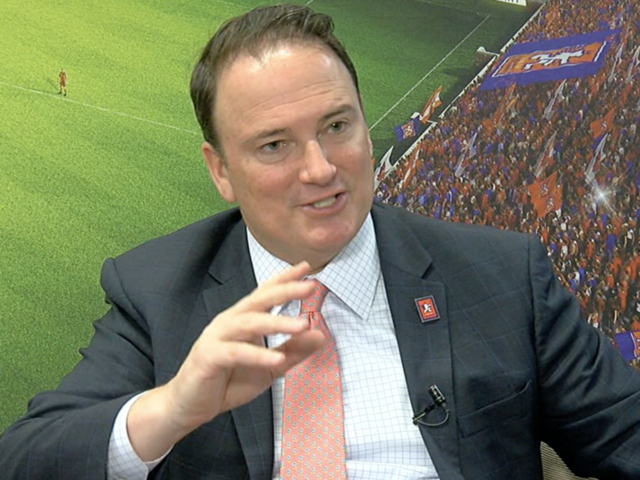 Berding said FC Cincinnati based its pitch on the club's remarkable attendance, its stadium plan and strong ownership group. FC Cincinnati averaged 21,199 fans per league game at Nippert Stadium last season -- a figure that would have ranked eighth among the 23 current MLS clubs and was nearly twice as many as Sacramento team’s in the USL. And FC Cincinnati says it has already sold nearly 15,000 season tickets for 2018. It plans to continue to play in the USL at Nippert Stadium for the next two years. With billionaire owners Carl Lindner III and Cintas CEO Scott Farmer footing the bill, FC Cincinnati says it is putting up $350 million to join MLS -- $200 million to build the stadium and $150 million for franchise fees. Spurred by lobbying from Mayor John Cranley, city council voted to provide $37 million in infrastructure for the new stadium, and Hamilton County commissioners pledged to build a 1,000-space parking garage at an estimated cost of $15 million.